Three years ago we were in the thick of fertility treatments. We had been trying for a third baby since July 2013 and by August 2014 we had done about 9 rounds of IUI. Because we had been unsuccessful with getting pregnant with IUI (after successfully getting pregnant through IUI twice before) my RE did an ultrasound before one of our inseminations and she noticed an abundance of uterine polyps and fibroid cysts. My doctor suggested that if that current round of IUI was not successful that we do another more intensive ultrasound to check the severity of the polyps. Our tenth round of IUI did not work. We still were not pregnant. We then went in for a *saline sonohystergram ultrasound. It was then she determined that I had quite a few polyps and some that were rather large. My RE suggested I undergo a minor surgery to remove them. At the time we felt that the polyps were a possible reason our IUI’s were not working. Our doctor also explained to us that she felt this would remove a huge stumbling block for us and that removing polyps from the uterus is a common procedure they do in assisting those suffering from infertility. Removing the polyps would clear my uterus and increase our chances of conception. Our doctor highly recommended having the polyps removed before moving forward with IVF- which was our next step. Having polyps and fibroids on my uterus was not only possibly affecting my fertility, but it was also affecting my quality of life during my menstrual cycle. I learned that uterine polyps also causes heavy bleeding during your period, spotting and painful cramping- all of which I experienced each month during my cycle. 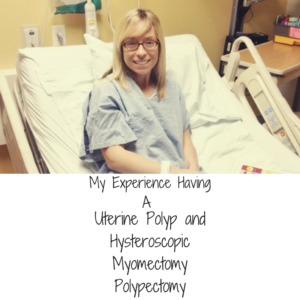 Because of our infertility and the symptoms related to my period- our doctor felt the polyps needed to be removed and she then scheduled me for a Uterine Polyp and Hysteroscopic Myomectomy Polypectomy. That’s quite the mouthful, right? Uterine Polyp and Hysteroscopic Myomectomy Polypectomy is defined as being a surgical approach of removal of uterine polyps preserving the uterus. Uterine polyps are a kind of non cancerous overgrowth of cells of the inner wall of the uterus that extend into the uterine cavity. These uterine polyps develop in the lining of the uterus. I would like to share my experience with having this surgery and hope it helps someone else who may need it. While I hope my insight helps shed a little light on the procedure, please consult your own doctor for instruction before your own surgery. After scheduling the surgery my doctor had me start a birth control pill on day 3 of my cycle to help thin my uterus lining. I took one pill a day up until surgery. The night before surgery I was told to eat a light meal, and to start fasting at midnight. The next morning I was not allowed to eat or drink anything before surgery. I was told not to wear any eye makeup or jewelry in for surgery. This is an out-patient, same day procedure that takes place in a hospital. My surgery was performed by my fertility doctor. I arrived an hour prior to my surgery time allowing time to check in, change into a gown and get situated in a room. I was told to bring another adult to assist me through the process and be there during surgery, and to take me home. At the time of the surgery I was wheeled out of my room on a gurney down a hall to the operating room. That was where I said good-bye to my husband and he was sent to the waiting room. I was met by nurses, my doctor performing the surgery and the anesthesiologist. I was given the chance to ask last minute questions and then had an IV started. After that I was wheeled into the operating room. It was cold, and they covered me with warm blankets. I was then approached by the anesthesiologist who inserted medication into my IV to make me sleepy and go to sleep– as you are under general anesthesia during the surgery. I remember up until that point and then I was out for the remainder of the surgery. The surgery takes about 15-20 minutes but it took me a little while to wake up after the surgery was done. I was still in the operating room until I woke up, after which I was rolled back into my recovery room. Some people feel ill as they come-to but I did not feel sick or nauseous but I do remember coughing a lot and not being able to catch my breath. The nurse was also feeding me ice chips. I felt very groggy and “loopy” for a while as I came out of the anesthesia and I was in the recovery room for about two hours until I was able to get up and walk on my own. I was given juice and crackers as I felt ready to eat. They tell you to not be left alone for about 24 hours after surgery. You are told to take it easy and rest for those 24 hours. I was given pain medication and was told to be prepared for light bleeding for a few days. I felt discomfort for the remainder of the first day and into the second day but overall the recovery was not too bad. I did not know that I was going to be intubated ( a tube down my mouth to assist with breathing) during this surgery. The hardest part of recovery was the sore throat from having the tube down my throat. My throat was scratchy and sore for several days after surgery and it was difficult to talk and swallow. My surgery was on a Friday and my husband had to work the next day. Although I was physically feeling mostly better I know I over-did it taking care of our two girls. I remember I also went to church on Sunday and at one point as I was talking to a friend I felt very light headed and groggy and I felt very weak. My advice is to take the suggestion of your doctor seriously and rest up and take it easy. Although this is a relatively minor surgery your body still needs time to heal, especially because of the anesthesia given and the pain medication you might be on. After having this surgery we had high hopes of being able to become pregnant. Our doctor told us our chances were higher now that I had a cleared out uterus. Unfortunately, pregnancy did not occur and we are still waiting for our miracle. Even though having this surgery did not end up helping our infertility- I am still grateful for the surgery and I am glad it was done. 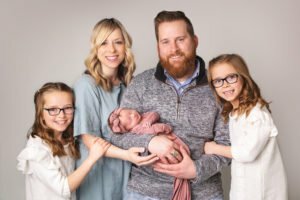 Several times the thought came to me that as parents we would do anything for our children– and that includes the children we are hoping and praying for to come into our family. It has been a long and hard road, but having the surgery done and doing everything we could- was just one more way that we could should love for our future children right now. Two years after having the surgery I became part of the 15% of patients who have the polyps come back. I noticed my periods becoming heavier each month and I made an appointment with my doctor. She gave me a sonohystergram where she discovered more polyps in my uterus. The recovery process was slightly different the second time around. I felt more nauseous coming out of the anesthesia than the first time and the first day following the surgery I felt really cloudy and slightly crampy. I felt no soreness in my throat because of the breathing tube which was a pleasant surprise. After day 2 of recovery I was mostly feeling back to normal. After resting on day 1, I was able to move around and mostly resumed all normal activity. The pain was not bad and I only needed to take Tylenol to manage pain. This is minor surgery and that benefits of having it done are totally worth it in my opinion. Thank you for writing your experience out. I am currently suffering from a uterine polyp. I am having a difficult time with this and absolutely scared out of my mind about surgery. We’ve been trying for a third living child since 2014 and we went ahead with SIS after 6th miscarriage in the past 2 years. They found one small polyp last week so I’m researching while I wait to see if my fertility doc or my recurrent miscarriage specialist recommend removal. Thanks for writing about your experience. I like feeling prepared. Thank you for writing your experience. I have a small uterine polyp which is being removed next Monday. Reading your experience makes me feel much better. I feel much more prepared now.